The USB 3.1 Type-C Hub is a light weight hub with a DIN Rail Mounting Kit. 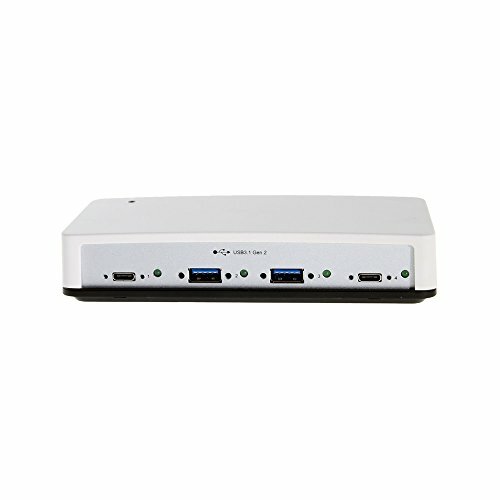 This hub supports USB 3.1 Super-Speed Plus (10Gbps data transfer) with (2) USB Type-A female and (2) USB female Type-C downstream ports. The USB 3.1 Type-C Hub uses a 2-pin terminal block connection for input power of +7 - 24V DC for the downstream facing ports (power supply is included). It is backward compatible with 5Gbps (Super-Speed), 480Mbps(High-Speed), 12Mbps(Full-Speed), and 1.5Mbps(Low-Speed) data rates. The plastic Mounting plate for the DIN Rail Clips snaps on to the bottom of the hub for secure mounting. Upstream information is carried with the USB-C connection on the back panel of the hub.